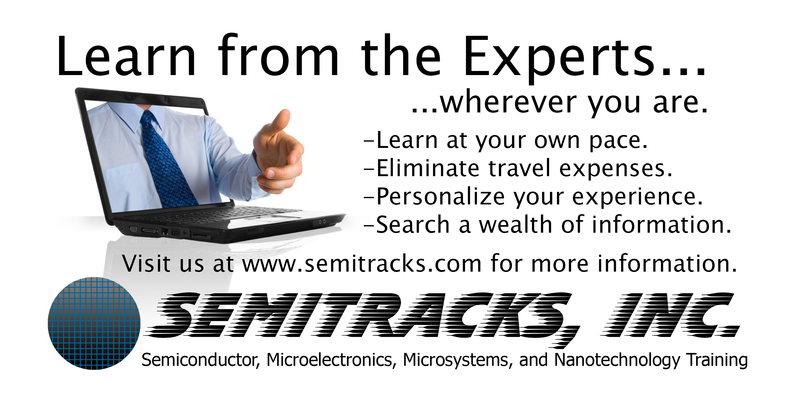 Let’s move on and discuss rapid thermal processing, or RTP, hardware. 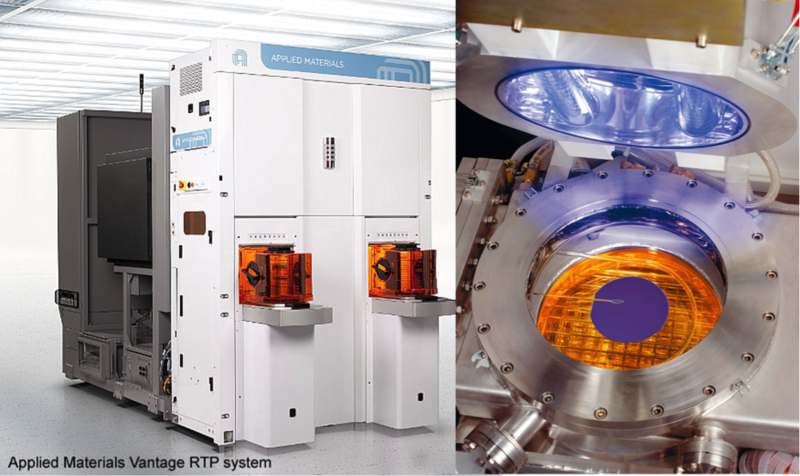 Engineers normally perform RTP one wafer at a time, so RTP hardware is designed to process one wafer at a time. The system rotates the wafer while in the system to minimize the effects of heating non-uniformities and gas flow non-uniformities. RTP hardware operates either at atmospheric pressure or reduced pressure, and is compatible with both dry and chlorine oxidations. Wet oxidations can be performed using in situ steam generation, where one introduces hydrogen and oxygen gas onto a hot wafer surface where they react and form steam. Obviously, this is a safety issue, and must be performed carefully with the appropriate mitigation protocols. Rapid Thermal Processing employs either cold wall or hall wall technology. Cold wall technology is the traditional method. 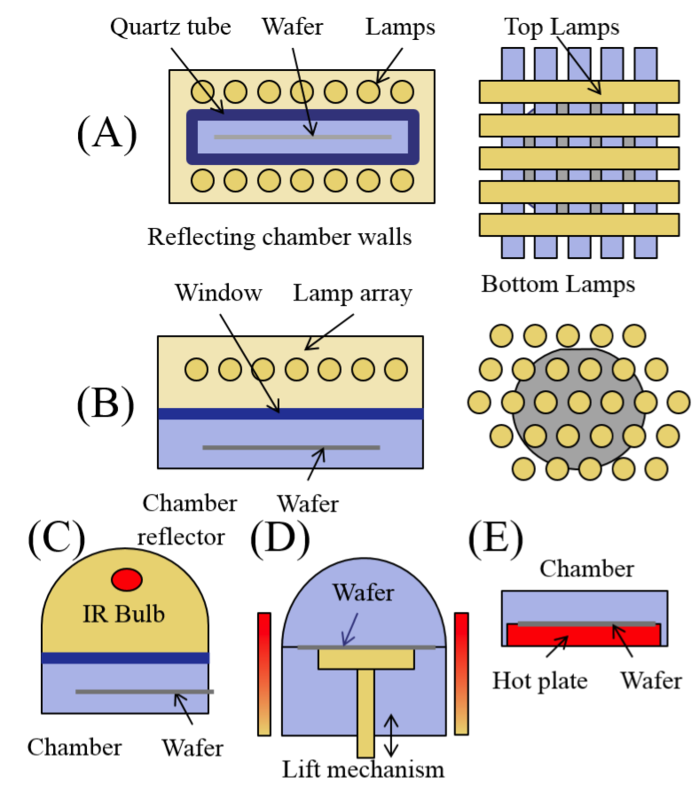 Here, an array of tungsten or halogen lamps heats the wafer through radiation. This process brings the wafer up to the required temperature within a few seconds. However, the wafer is not in thermal equilibrium with the chamber itself or the lamp, so this can lead to non-uniformities in the anneal process. Hot wall technology is the newer method. Here, heating elements like silicon carbide radiate blackbody heat to the wafer through convection and conduction. This method leads to a more uniform temperature profile, which means a more uniform anneal process across the wafer. The manufacturers of rapid thermal processing equipment have created various designs and configurations for use in the semiconductor industry. These drawings show the more common configurations. They range from quartz tube and lamps, like we show in figures A and B, to chambers with IR bulbs, rods, and hot plates, like we show in figures C, D, and E respectively. Rapid thermal annealing is fast becoming the first choice for thermal processing steps. Engineers use rapid thermal annealing for post-implant damage annealing and dopant activation, where the heat drives the dopant atoms to the lattice sites to become electrically active. They form metal silicides for contacts with the technique. Materials like titanium, cobalt, and nickel silicide lend themselves well to rapid thermal processing. Process engineers also perform rapid thermal oxidation to create thin oxide and oxynitride layers for transistor gates, capacitors, pad oxides, side wall spacers, and shallow trench isolation liners. Rapid thermal processing has many advantages over atmospheric oxidation furnaces. First, RTP can heat and cool the wafer very quickly. For example, one can achieve a 250 degree centigrade per second temperature ramp-up and a 90 degree per second ramp-down, which minimizes dopant redistribution and transient-enhanced diffusion effects. It also provides engineers with lower and better control of the thermal budget and better process control. Second, because of the potential short cycles, RTP allows one to grow oxides at higher temperatures. This leads to higher quality films with less trapped charge and less leakage. It also leads to higher carrier mobility due to a smoother interface at the silicon-dielectric interface. Third, rapid thermal processing, being a single wafer tool, lends itself well to clustering with other tools. For example, one can integrate pre-clean, rapid thermal oxidation gate formation and gate polysilicon deposition into the same cluster tool. Fourth, RTP provides excellent process flexibility. Engineers can run at atmospheric or reduced pressure, and they can utilize a wide range of process gases for steps like low-k dielectric deposition. Fifth, since RTP can be performed on a wafer-by-wafer basis within a cluster tool, RTP can therefore be an ultra-clean process. The main challenge is temperature measurement and control, including the ramp-up, soak, and ramp-down steps. These images show examples of rapid thermal processing hardware. The image on the left shows a rapid thermal processing system from the exterior. The image on the right shows the RTP chamber, with a wafer in the system. One of the challenges with Rapid Thermal Processing is temperature measurement. Normally, one measures high temperatures of objects using optical techniques. Basic radiation physics includes a concept called a blackbody. A blackbody is a theoretical object that absorbs all the radiation it receives. It then emits a characteristic temperature-dependent spectrum of radiation. For example, the sun is almost an ideal blackbody. It absorbs almost all of the incoming radiation. Since the surface of the sun is approximately 5500 degrees centigrade, it emits a spectrum of radiation that peaks in the visible range, creating that bright white light we see. That radiation spectrum also includes ultraviolet and infrared light as well. We feel the infrared light as warmth on our skin on a clear summer day. The second concept is emissivity. This is the ratio of energy radiated to the energy by a material to the energy radiated by a blackbody at the same temperature. While the sun is almost a perfect blackbody, having an emissivity near 1, an object like a mirror—a polished silver surface—has an emissivity near zero. In other words, it has a high reflectivity. Power and temperature are related by the Stefan-Boltzmann radiation law, shown here, where W is the total power, sigma is the Stefan-Boltzmann constant, and T is the temperature of the object. The most common optical measurement tool for RTP is the optical pyrometer. It is a non-contact tool that determines the temperature by measuring the wafer’s emissivity. It is the main technique used in cold wall RTP hardware. 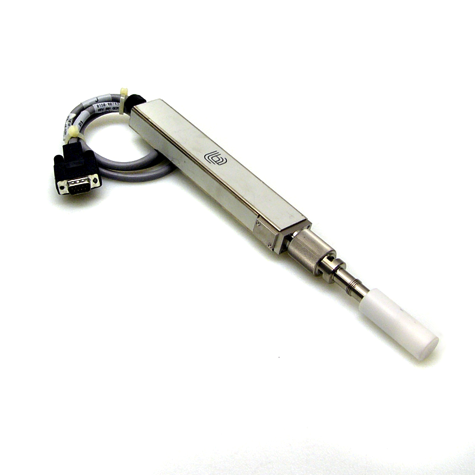 This is an example of an optical pyrometer. The challenge with optical pyrometry is the difference from wafer-to-wafer, lot-to-lot, and technology-to-technology. Since we’re measuring emissivity, the emissivity is a function of the backside films and the reflectivity. This means the coatings and the backside preparation play a big role in the accuracy of the readings. As such, many hot wall reactors use both thermal couples and optical pyrometers. Let’s move on to briefly discuss the ancillary tools for thermal processing. There are two common tools for measuring oxide thickness: the reflectometer and the spectroscopic ellipsometer. The reflectometer uses optical interference. It determines the interference between the light reflected at the air-silicon dioxide interface and the light reflected at the silicon dioxide-silicon interface. This technique only works on oxides thicker than 10 nanometers. The spectroscopic ellipsometer uses a laser to look at changes in polarization that occur when the light reflects off of the silicon or silicon dioxide surface. The polarization change depends on the spectrum, so the spectrum can provide more accurate data. This technique works on dielectrics down to 5 angstroms, and can be applied to a wider range of materials than just silicon dioxide, making it a good choice for low-K and high-K dielectrics. Finally, the transmission electron microscope can be used for offline verification of very thin oxides. Since it requires destructive sample preparation, it must be performed outside of the normal process flow. An increasingly common type of probe card is the vertical probe card. The image on the left shows an octal (8) site vertical probe card from Form Factor. The probes pass through two offset plates, which create a bend in the probes. A reduction in the amount of bend in the probes lowers the probes and generates the pressure on the pad required to make positive contact. This approach or technology is sometimes known as buckling beams. We show examples of the probe marks on the pads in the image on the right. The probe mark left by the vertical probe is typically smaller than that left by a cantilevered probe. This type of probing will generate fewer particles, and can facilitate probing an array of pads, since the probes do not take up as much lateral area as cantilevered probe tips. Q: Why do engineers use more than one algorithm to identify outliers? A: The reason stems mainly from the type of distribution related to the parameter used for outlier identification. For example, if we use diode breakdown voltage as an identification parameter, the distribution of breakdown voltages is typically a normal distribution. That means that algorithms like the 3-Sigma algorithm will work well. On the other hand, if we use a parameter like IDDQ, the distribution for IDDQ is typically right-skewed (a tail of data that extends to higher currents moreso than to lower currents). In this case, an algorithm like Tukey or CPKn will tend to do a better job. Many engineers actually prefer the CPKn algorithm when the tails are significant.